Lifeweaving #3: 9 Stages of Life has been in process for a long time and finally it is the key piece in an exhibit, Lifeweavings: A Creative Journey! It was so exciting to finish this piece because it has so many layers of meaning for me. Inspired by books by Joan Anderson (A Walk on the Beach and others) and Joan Erickson’s 9th stage of life, this is the 3rd Lifeweaving in a series entitled, Transitions. 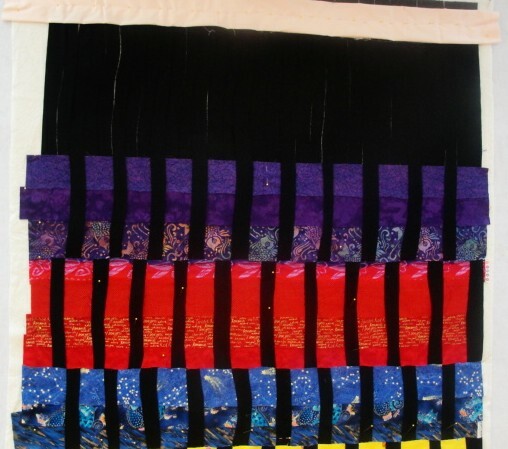 Lifeweaving #3: 9 Stages of Life, 59″ x 45″, rayon and metallic on cotton. Woven fabric strips, machine and free-motion quilting. (c) 2014 Joni Beach. In earlier posts, you have seen its beginnings when I first wove the strips of fabric together. Recently the quilting to hold it all together was completed. I decided to use a small zigzag to join the strips and stabilize the piece. Because of the raw edges I found a double row of stitching worked much better. The words are the strengths and traits people can gain at each stage of life, from infancy through very old adulthood. For example, in stage 1 , trust and hope. It was interesting how in the process of creating, I had time to consider each stage, my experiences, and what I feel I’ve gain along the way through-out my life…Where am I located on the wall hanging? In the middle? Near the top? At the bottom? People at the exhibit’s opening on Friday enjoyed viewing Lifeweavings #3 and had fun trying to find the words that were in each section. It will be on exhibit through March 31st and available at Eucalyptus Massage Center Gallery. Please visit my website Art Gallery to view other pieces in the Transitions series! I have played with these ideas for several years while studying human development. In Lifeweaving #3 , my interest in art and life transitions are merged. 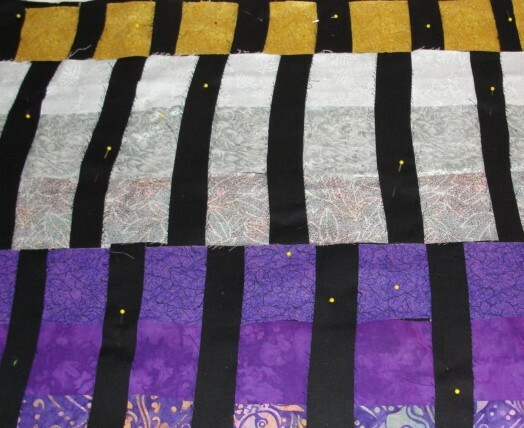 The final strips–silver and gold–representing the 8th and 9th stages of life are finally woven. My next step will be to layer the top with a batting and backing-basting the woven strips in place and quilting to add more texture to the design. After designing and beginning this piece, I found an interesting book, Plaited Patchwork by Shari Cole, in our local library. Shari describes her method of weaving fabric to make quilts that was based on the Pacific Islanders’ plaiting techniques for making woven mats. Interestingly, her method is very similar to what I was already doing for Lifeweavings #3. So as this part of my project is finished, the quilting will begin… I will keep you posted on my progress– that is…my lifeweaving! Easter…family together…egg hunt…chocolate bunnies…basket surprises…giant bunny from uncle N….baked ham & bunny cake…fun times…Spring is here! Yeah! We normally think of time in a linear pattern—from young to old, year to year, A to Z–but perhaps someday quantum physics will show us how it really is not in a stepwise order. The life experience seems sort of circular in pattern and perhaps it is…This weekend was a time for family. As we were reminiscening, I remembered my children and I being like peas in a pod when they were growing up–close together while experiencing daily adventures. Though it has been at least 8 years since my last child left home to begin their own solo life adventure, and though I encouraged their independence, I still miss that closeness. Some of my latest art pieces have been illustrating the stages of life, infancy through old age, in a more linear manner. Lifeweaving #3 unfinished. Woven cotton. © 2011 Joni Beach. The top piece of my Lifeweaving #3 art quilt is in the final stages of being woven and basted…I still need to weave in the color silver for the decades of ages 60-the mid-80s and gold for ages mid-80s through the 90s. Joan Erikson, wife of psychoanalyst Erik Erikson, helped develop the life stages as written in The Life Cycles Completed (1997). They named the strength gained in the stage of ages 60-mid 80s as wisdom. Later, Joan added the ninth stage and identified the strength of the final stage as geotranscendence. 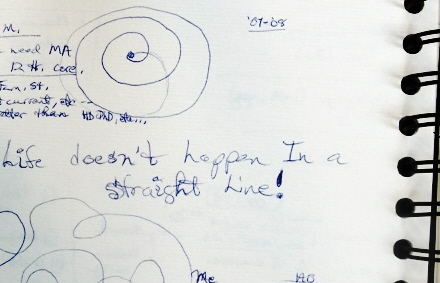 Next, I want to explore visually the idea of life being experienced more in circular or non-linear patterns. 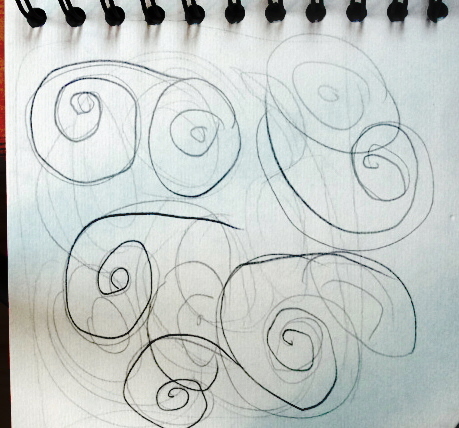 These are drawings from my sketchbook that shows this idea has been in incubation for awhile! 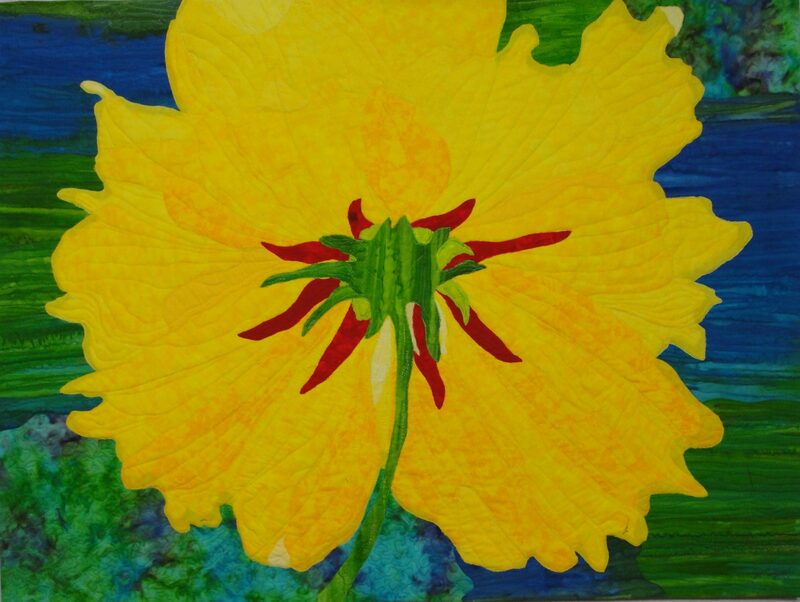 The Studio Art Quilts Associates (SAQA) has an on-line Benefit Auction in September. 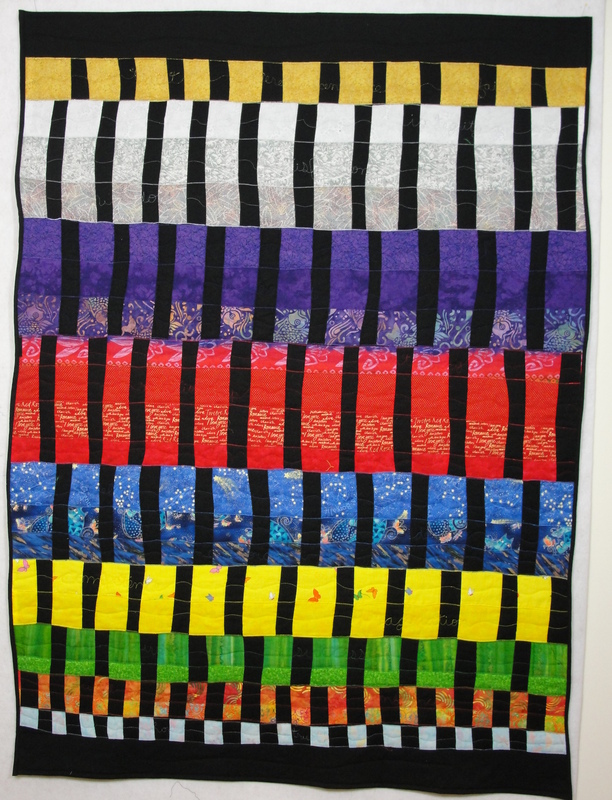 Members donate 12” square art quilts to be auctioned off.–Be sure to check it out!–I am using this as an opportunity to experiment and explore these and other design ideas in this smaller format…stay tuned for that progress and which one will be chosen for donation. I may need your help deciding! 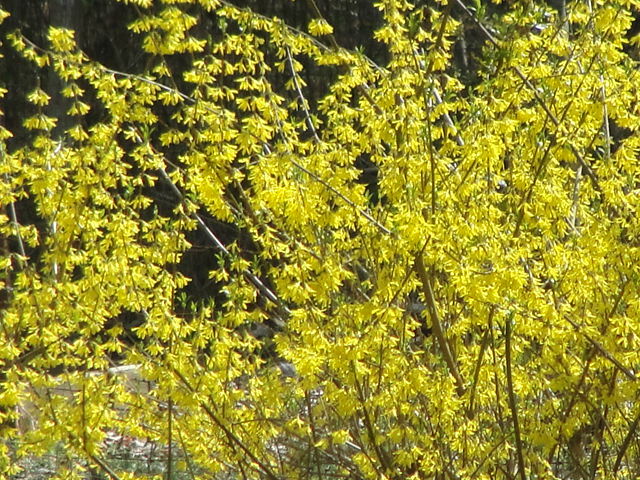 *I’d love to hear your comments…..What do you think about time! ?